It’s encouraging to see a children’s book focused so specifically on the value of kindness, and one that gives so many definitions of what that term can mean. 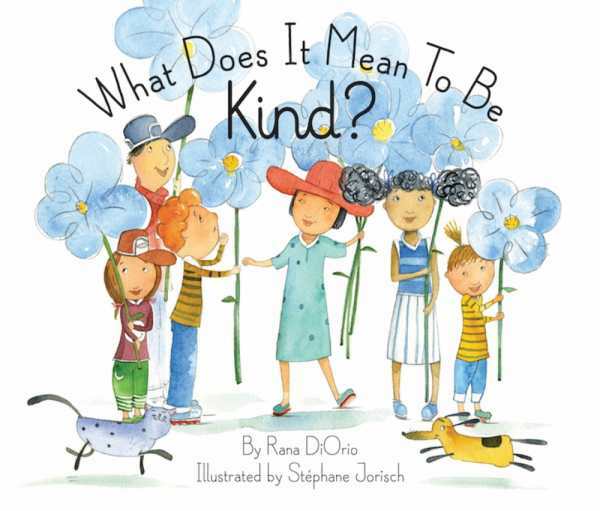 In the picture book What Does it Mean to Be Kind?, author Rana DiOrio has a number of answers to that titular question, all based on the idea of the golden rule. Colorful illustrations by Stéphane Jorisch show a variety of DiOrio’s suggestions in action, helping the book come together as a straightforward, gentle lesson for children about the value of kindness. The examples of how to be kind range from simple gestures like smiling at a new student or holding a door for others, to more complicated actions like forgiving someone, learning from mistakes, or taking time to understand why a friend is sad. The examples include both kindness in deed and kindness in word, with saying “please” and sharing among the ways kindness is shown, and the pictures feature friendly children doing so. The images have a welcome diversity, not only featuring children of different races, but children of different sizes and with different personal styles. A cute cat and dog are included in the images as well, often adding some visual humor (for example, in a whimsical art exhibit with works involving the cat, or with both pets hiding from rain under plant leaves). It’s encouraging to see a children’s book focused so specifically on the value of kindness, and one that gives so many definitions of what that term can mean. It’s also pleasant to experience the kind treatment of animals as part of what it means to be kind. The publisher includes a note in the book about their use of environmentally sustainable materials in production, demonstrating the book’s lessons in practice. This is a charming book with a welcome perspective.